IN his continuing search for the more weird, wacky and wondrous in this world, David Ellis says that when it comes to bridges, China's got the rest of the planet beaten by a country mile for having the longest one in the world. Because it's Danyang-Kunshan Grand Bridge between the cities of those two names, stretches an incredible 164km, or 102 miles, and took 10,000 workers four years to build using some 450,000 tonnes of steel and 1,800,000 cubic metres of concrete. 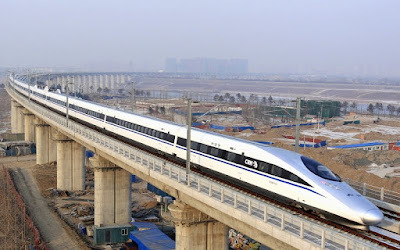 On average 31m (100 feet) over lowland farms and rice paddies, canals, rivers and lakes, and winding its way around cities and towns along the way, the bridge was built as part of the 1,300km (811 miles) Beijing-Shanghai High Speed Railway. And while it was completed in 2010, a whole year was taken testing it with train after train running its whole length over and again to ensure its stability, and with the first official passengers going aboard on June 11 2011. The Danyang-Kunshan Grand Bridge cost the equivalent of AU$11.5b to build, with a mix of thirty-three high-speed and express trains now using it at any one time daily, and offering Second Class, more spacious First Class and luxury Business Class options. And the fastest trains have only one stop along the 164km journey, helping trains on the Beijing-Shanghai High Speed Railway do that 1,300km trip in just 4-hours-48-minutes at speeds of up to 300km an hour.